The first part of the Eighth Gate of the 11:11 was activated on February 11, 2007. The Master Cylinder was located in the Orient Valley, on the island of Mallorca, Spain. 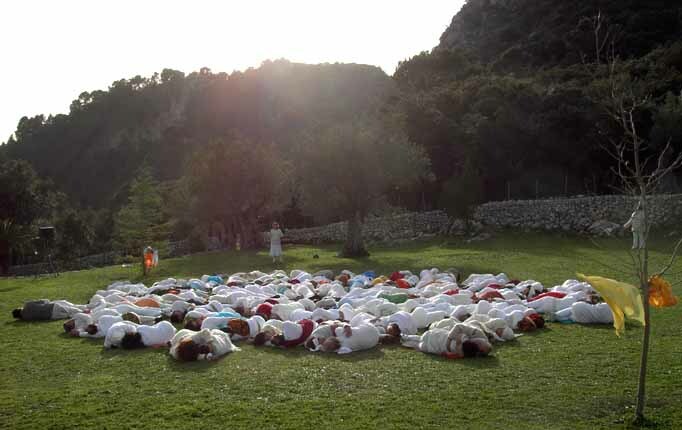 and our Eighth Gate Activation Ceremony was located in the Orient Valley, Mallorca, Spain. with our True Purpose of serving the ONE. The Lotus Heart becomes our New Foundation. The Lotus Heart symbolizes our new emotional body, the level beyond the One Heart. a stronger, more real LOVE than any we have ever known. Before we could fully enter the Lotus World, we had to pass through a Band of Distortion.This is the brilliant filtering system of the Lotus World. The Band of Distortion brings up to the surface, in a highly magnified and distorted manner, anything within us which is impure, unreal or untrue. During the Activation of the First Part of Eighth Gate, we entered the Band of Distortion. This made it one of our most difficult Activations.Yet despite the challenges, at the beginning of the Dance of the Elements, we managed to impregnate the egg of the White Dragon using the Phallis of Osiris and the Egg of Aphrodite. We knew that the White Dragon would be born during the second Eighth Gate Activation. Some of us passed through the Band of Distortion quickly, while for others, it took longer. During the two years between the two Eighth Gate Activations in 2007 and 2009, we diligently sifted through our beings, clearing out any expired emotional residue from the past. We healed our emotions and started removing all duality-based beliefs. The more that we cleared ourselves of everything that was expired and untrue, the freer we became. Our final initiation of moving through the Band of Distortion occurred when we were thrust into our Perfect Storms. This was a rare alignment of core challenges combined with our innermost fears. We could not fully enter the Lotus World until we passed through the Band of Distortion and our Perfect Storms. This is why it took so long between the Activations of Eighth Gate Part One in 2007 and Eighth Gate Part Two in 2009. Once we emerged from the Band of Distortion, we realized we had become much more True and Real than ever before. We were ready to enter the Lotus World and embody PURE HEART LOVE. we passed the turning point of NO DOWN – NO RETURN. When we align our entire beings with the Lotus Heart, we break through a membrane that kept separate all the elements within and without us that were always meant to join together in Sacred Union. Once this membrane dissolves, we can enter the Lotus World. The Lotus World is a sublime realm infused with the most exquisite PURE HEART LOVE. It was the strongest Love we had ever experienced before. Once we feel the Lotus Love coursing through us, the dam breaks and we are plunged into the River of Love. The powerful currents of the River of Love are experienced on a level we never thought possible except in our wildest dreams and deepest, most intimate yearnings. The River of Love ever widens and deepens until everything else becomes a blur. And it leads us into the immeasurably deep Sea of Love. As we entered the Lotus World, we were required to be REAL and TRUE like never before. We moved into the realm of RIGHT TIME – RIGHT PLACE. This opened the door to the fulfillment of our Wildest Dreams.